Mark Zuckerberg is to hold a series of public discussions on the subject of technology and its future in society. 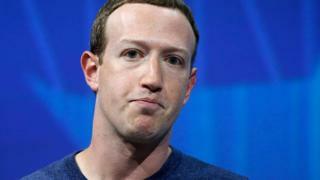 The Facebook boss plans to tackle issues such as artificial intelligence (AI) and jobs, free speech on the net and the growth of online communities. He said he would talk to "leaders, experts, and people in our community". Every year Mr Zuckerberg sets himself challenges, which in the past have included running 365 miles, visiting every US state and learning Mandarin. He admitted that he would find the discussions - his challenge for 2019 - taxing. "I'm an engineer and I used to just build out my ideas and hope they'd mostly speak for themselves," he wrote on his Facebook page, where he announced the news. "But given the importance of what we do, that doesn't cut it anymore. "So, I'm going to put myself out there more than I've been comfortable with and engage more in some of these debates about the future, the tradeoffs we face and where we want to go." He said the discussions would be viewable either on Facebook or Instagram or "other media". While some replies to his post were supportive, others suggested Mr Zuckerberg should focus on issues closer to home, namely the way in which Facebook shared user data. Technology journalist Casey Newton questioned whether "a talk show" was the right approach for the chief executive. "I'm all for open discussions of the most pressing issues facing business and government - and I hope Zuckerberg chooses to sit down with some of Facebook's more thoughtful critics for a lively debate," he wrote on technology news website The Verge. "And yet I can't help but wonder, given all his other responsibilities, why Zuckerberg sees a series of live broadcasts as a particularly good use of his time." In other Facebook news, the social network giant has been accused of breaking a new cyber-security law in Vietnam by allowing anti-government posts. The law came into effect on 1 January 2019. The Vietnam News Agency said Facebook had not responded to requests for it to remove "fan pages provoking activities against the state". Facebook said it worked with local authorities. "We have a clear process for governments to report illegal content to us and we review all these requests against our terms of service and local law," said a spokeswoman.